One thing I didn’t think about when it came to hair loss from chemotherapy was that I’d lose my eyebrows. It was subtle. I always had thick brows that I thought made me look angry, so I plucked them to make them thinner and arched. Then one day I looked at myself in the mirror, trying to figure out why I looked a bit different and realized my eyebrows were gone. A feature of my face that I abused over the years with tweezers, had disappeared. Since I wear eyeglasses, this change wasn’t shocking.There were days when I needed to go somewhere other than the infusion suite, and I made a feeble attempt to use a brow pencil or powder to draw brows on my face. I soon gave up since I didn’t have any guidance for where they should be. Plus my brow pencils and other brow products weren’t that helpful without hair to adhere to. Enter SurvivorEyes. SurvivorEyes are brow stencils created by Elizabeth “Lisa” Brambilla, a breast cancer survivor. The stencils come in 10 brow templates to complement different face shapes. 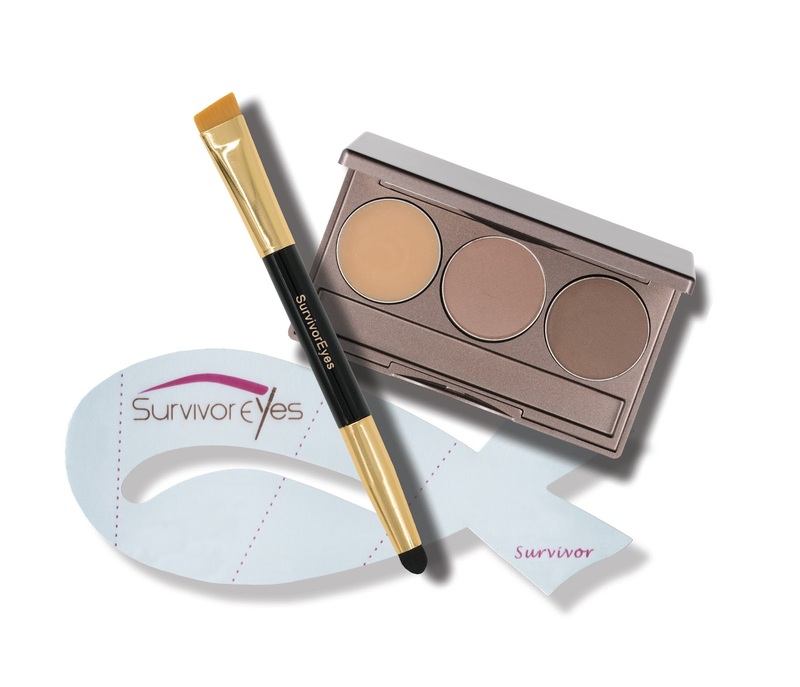 The SurvivorEyes BrowStyle Kit ($39.95) features Sormé Cosmetics and is available in three shade palettes, (Soft Blonde, Brunette and Dark Brown) with guidelines for placement and a dual-sided cosmetic applicator, presented in a drawstring bag. Each unique stencil shape has a name “Faith,” “Courage,” “Warrior” or “Determination” to inspire strength. My “brows” looked natural and I continued to use the kit for shaping once my eyebrows grew back in. If you want to use your own brow makeup, you can purchase the SurvivorEyes Brow Stencil Kit for $14.95 which contains eyebrow stencils, a dual-sided application brush and instructions for care and use. For more information visit SurvivorEyes.com. Note: A sample was provided for review. This month I am writing about some helpful products that I used while undergoing breast cancer treatment. Six months into my chemotherapy treatment, I suffered complete hair loss. As I discussed wigs with a neighbor, she mentioned that as my hair grew back in, my scalp would probably be itchy and tender. 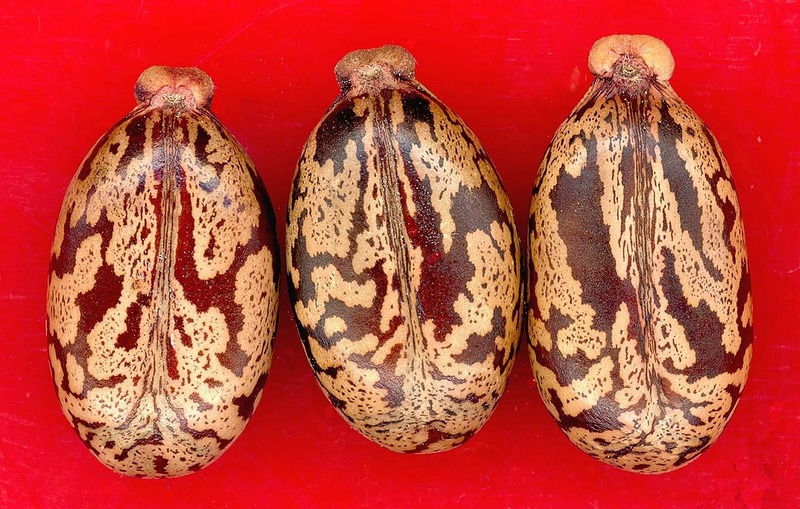 She learned about this from a friend who had also gone through chemotherapy and was using black castor oil to relieve the discomfort she was experiencing. 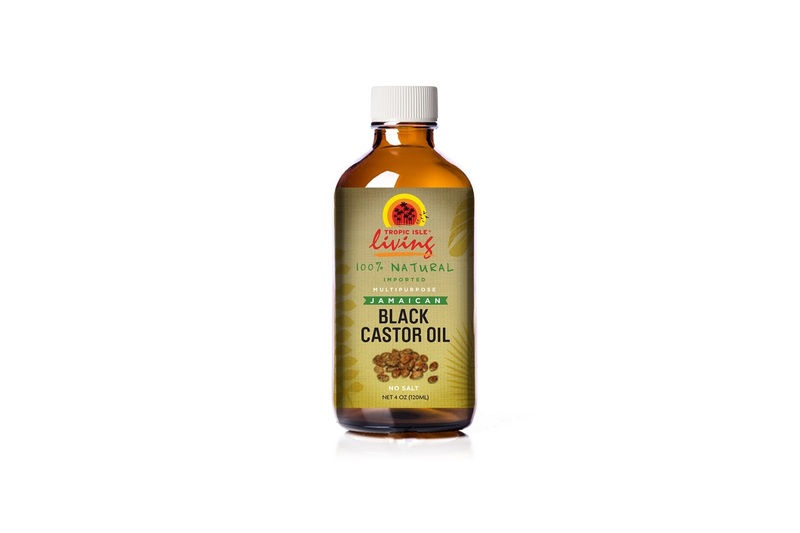 I have written about black castor oil in the past, but never got around to actually trying it. It’s typically used as a hot oil treatment for hair and can be found as an ingredient in shampoos and hair treatments to treat dandruff and as a stimulus for hair growth. 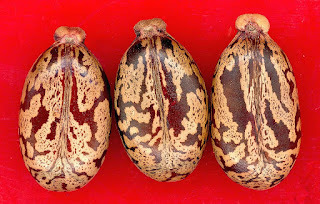 It has higher alkaline pH levels than regular castor oil, so it has more clarifying properties. It exfoliates the scalp and unclogs hair follicles and can treat certain scalp conditions. I was in a beauty supply shop looking at wigs and asked about the black castor oil. The clerk handed me a bottle of Tropic Isle Living Jamaican Black Castor Oil and told me that it was a popular brand with the customers, so I bought it. I started using it and it did ease the sensitivity and itchiness in my scalp. A few days after purchasing the black castor oil, I heard from a representative for Tropic Isle Living about the company. It was launched in 1992 by founders/husband and wife team Michael Hines and Lois Reid-Hines. The company sells natural hair, skin and body products made from oils, herbs and berries from Jamaica, the Caribbean and Africa. In addition to Jamaican black castor oil, the company also has products like red pimento oil and coconut oil. (I’ll write about these products in the future). I would massage the oil into my scalp at night and cover it with a satin scarf or bonnet. Black castor oil can stain, so you have to be sure to cover the hair if it’s going to be in contact with fabrics. I’m not crazy about the scent of castor oil, but the chemo drugs probably made my scalp super-sensitive, uncomfortable and at times, even painful to the touch. The Jamaican black castor oil soothed my scalp. The medical staff was also surprised at how fast my hair grew back in. You can find out about Jamaican Black Castor Oil and other Tropic Isle Living products by visiting tropicisleliving.com. Radiation is often part of the treatment regimen for breast cancer. Some of the side effects for skin can be irritation, itchiness, tenderness and darkening or reddening in the radiated area. While undergoing treatment, there will be recommendations to ease any discomfort, such as using a cool compress. Fortunately I didn’t experience much of that, not even the typical darkening or redness of the skin. However, I did experience dryness. I was given home care instructions for use during breast radiation and following treatment. Avoid wearing tight clothing or irritating fabric (such as wool), or tight bras—I stuck with comfortable cotton sports bras. 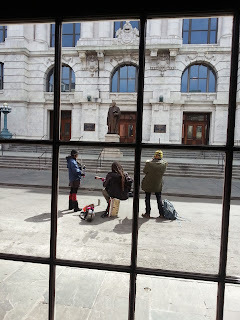 Keep the area covered and protected from sunlight when going out. Take showers instead of baths. Make sure the water is not too hot and doesn’t directly fall on the breast. If you do take baths, avoid soaking the area while in the tub. Avoid harsh soaps. Make sure they are mild and preferably fragrance-free. 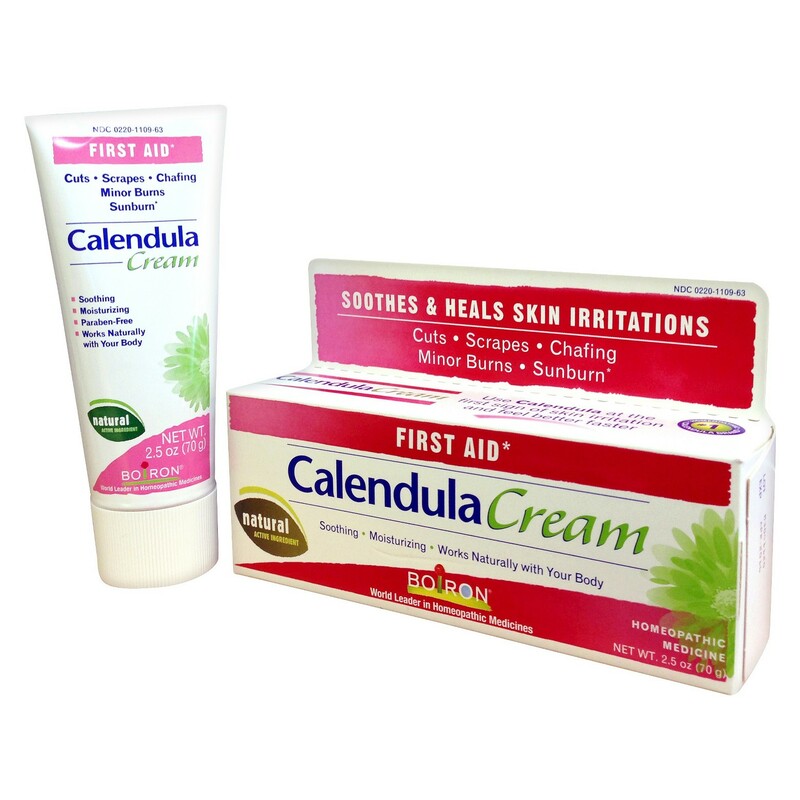 I was given Boiron's Calendula Lotion to use twice daily, starting with the first day of radiation treatment. I’d take the bottle along with me and apply it right after the radiation treatment to minimize reaction, and then again later in the evening. 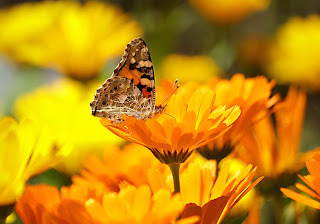 Calendula (calendula officinalis) also called marigold, is native to Asia and Southern and Central Europe and is now cultivated throughout North America. Calendula has been used for centuries to treat cuts, bruises and minor burns because it speeds up the healing of skin irritations and wounds. Calendula’s healing anti-inflammatory and antiseptic properties are due to the presence of plant chemical compounds such as saponins and flavonoids. 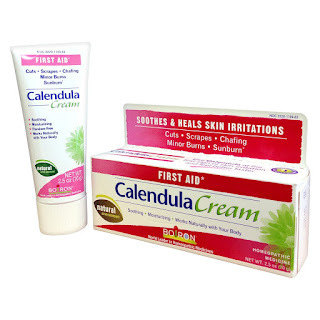 The Calendula Lotion is water-based, making it good for use on large areas. It’s soothing to skin irritations, insect bites, rashes and sunburn. (Some women have likened the effects of radiation to getting sunburn.) There are other ointments that can be used during radiation and natural remedies such as aloe vera gel (from the actual leaf)—which I found too sticky. The Calendula Lotion quickly absorbed my skin and didn’t get on my clothing at night (some ointments will stain clothing). Always ask your radiologist about what you should use on the skin. You can find more information at breastcancer.org which has other tips for taking care of the skin during radiation treatment. Should You Switch to Natural Deodorants? When I learned that I had breast cancer, my thoughts went to the cause. Genetics? Possibly. Due to the tumor's location, I wondered, Was it the spray deodorant I tried? After all, it caused a mild asthma attack, so what else could it do? Through the years I’ve read negative reports about aluminum in antiperspirants, but that didn’t stop me from using them. I would wonder about all the chemicals in my personal care products. I would be scared for a few days and then go back to them. This time it was different. I read up on deodorants and antiperspirants again and noticed there were concerns with conditions that could increase body exposure to estrogen. Excess estrogen has been linked to an increased risk of breast cancer. Antiperspirants contain aluminum-based compounds such as aluminum chlorohydrate or aluminium zirconium tetrachlorohydrex gly, which are used to block sweat glands to keep sweat from getting to the skin’s surface. Some researchers believe that it can be absorbed by the skin and cause changes in estrogen receptors of breast cells and therefore may be a risk factor in the development of breast cancer. Others say that only a tiny fraction of aluminum is absorbed. Researchers haven’t found a definite link between breast cancer and antiperspirant use and there’s little scientific evidence to support this claim. Then there is the issue of parabens. Parabens, which are used as preservatives in several products, can be absorbed into the skin. Studies have shown that parabens have weak estrogen-like properties. This hormone is known to cause breast cells (normal and cancerous) to grow and divide. However, the CDC reports that parabens that enter the body are quickly excreted. It’s also believed that natural estrogens made in the body or those taken as hormone replacements are more likely to play a role in breast cancer. So what should you believe? After being diagnosed with triple negative breast cancer last year, I figured, why not at least pare down products that have ingredients that might be unhealthy for my body. I started using Crystal Essence, which I remembered from a BCA event years ago. My cancer treatment began last year in October, just in time for Breast Cancer Awareness Month and it just so happened that I was contacted to test out some of the Crystal Essence roll-ons for possible review. My problem with deodorants are that they usually just mask odor and don’t keep you dry. With the Crystal Essence scents there was no odor when sweating (due to a chemical-free odor-killing barrier that blocks the formation of bacteria that causes odor). The roll-ons, available in Lavender & White Tea, Vanilla Jasmine, Chamomile & Green Tea, Pomegranate versions, are lightly scented and infused with essential oils and extracts. And fortunately, I noticed that my t-shirts and tops aren’t permeated with a strong fragrance after yoga or working out, which has happened with other scented deodorants. 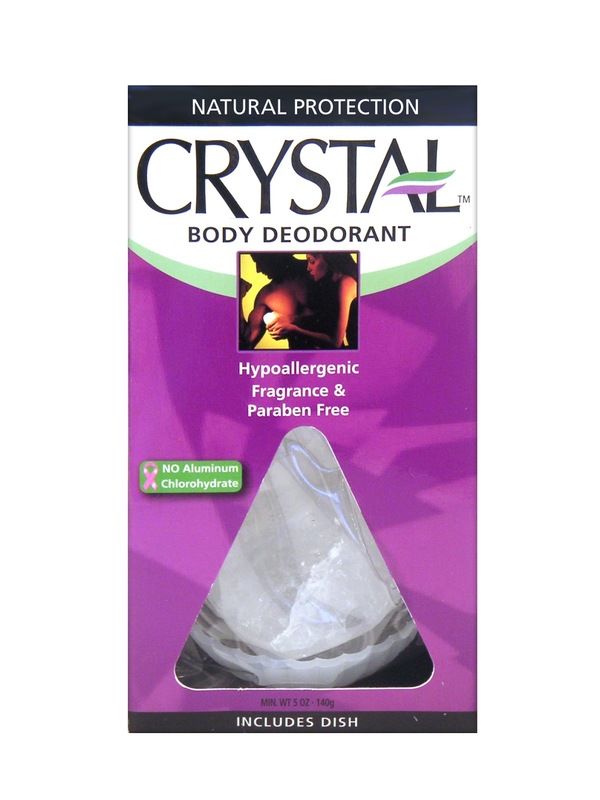 I also tested the Crystal Body Deodorant stone, which I took with me while traveling and it worked well, even in hot temperatures — and didn’t stain my clothing. 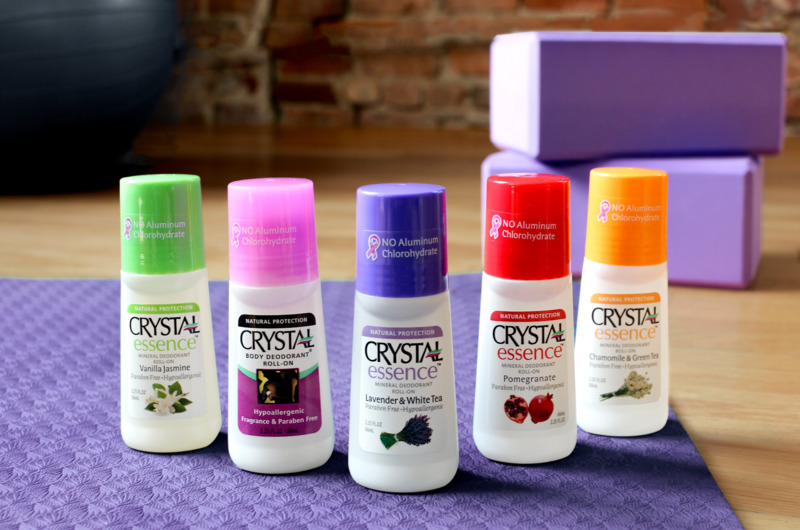 Please note that the Crystal Essence roll-ons and the Crystal Body Deodorant stone are not completely aluminum-free. Crystal Essence contains potassium alum and the Crystal stone contains ammonium alum. These are a different kind of aluminum made from mineral salts that, as I mentioned before, form a protective layer on the skin to inhibit the growth of odor-causing bacteria.The molecules are considered to be too large to be absorbed by the skin. These type of deodorants are often recommended by cancer treatment centers and organizations because they are safer than the aluminum in antiperspirants. Some individuals don't even trust alum-based natural deodorants. To reduce exposure, I only use the deodorant when I'm going out, working out or doing something that will cause me to sweat. The Crystal Essence Roll-on is $4.75 and the Crystal Body Deodorant Rock is $6.99 online at thecrystal.com. You can’t visit New Orleans without having Breakfast at Brennan’s. Located in the French Quarter, Brennan’s is the breakfast tradition. This is not breakfast you can rush through. No quick cup of coffee, two fried eggs and toast. Make sure you have enough time to leisurely enjoy your meal, which starts off with an “eye opener,” an alcoholic drink such as a Cajun Bloody Mary or Brandy Milk Punch. Then try the New Orleans Turtle Soup as an appetizer followed by one of Brennan’s famous dishes such as Eggs Hussarde (poached eggs on homemade English muffins, coffee cured Canadian bacon, hollandaise and marchard de vin sauce). Even if you’re stuffed and you probably will be at this point, you must finish with dessert. The world famous Bananas Foster is insane. 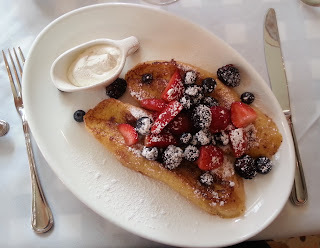 (Of course if you’ve already had an early breakfast, you can get away with an eye opener, Turtle Soup and Vanilla Scented French Toast, which I did this go-round since I experienced the more traditional breakfast on an earlier visit to NOLA. Brennan’s has recently undergone a few renovations, so be sure to walk off your breakfast by taking a moment to peek at the restaurant’s Courtyard, the Murphy Room (a chess room) and other dining rooms (each “tells a specific story”.) 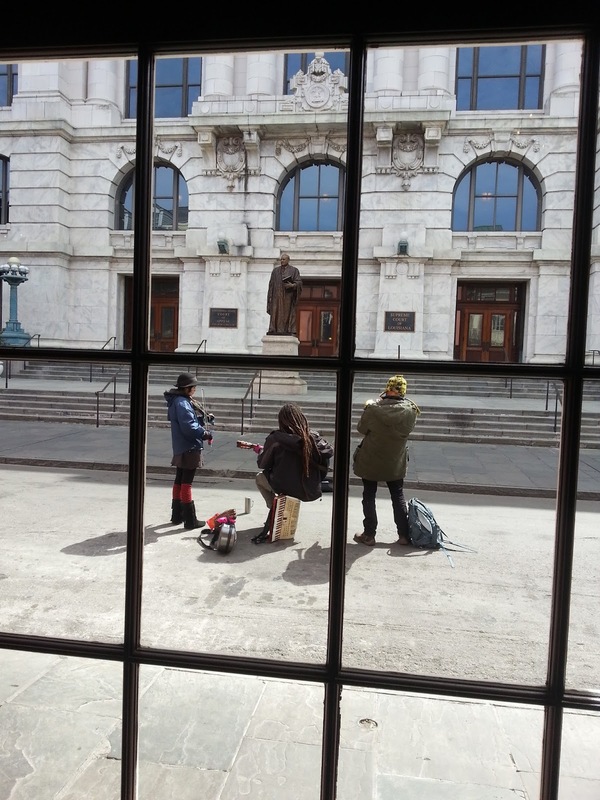 The front room, which once served as a kitchen, is now a lovely dining room with views of Royal Street and the Supreme Court House of Louisiana. 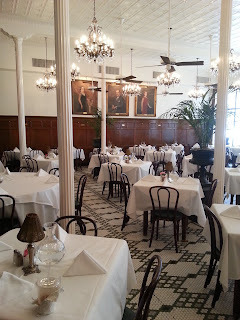 Brennan’s, 417 Royal Street, 504-525-9711, www.brennansneworleans.com. SoBou, described as a “spirited restaurant south of Bourbon,” is inside the W Hotel on Chartres Street in the French Quarter. I was offered a sampling of signature dishes, such as the Yellow Tuna Cones (from Snacky Things on the menu). The cones are designed to pop the whole thing in your mouth, if you can, and are delicious. 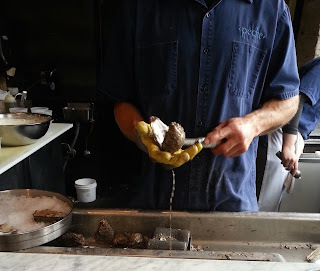 From the Small Bites, I had the YellowFin Tuna En Escabeche (grilled onions, pickled fennel and local citrus) and the Gumbo Du Jour, which on that night was 7 Greens Gumbo, a 100% vegan gumbo, with seven different greens, including black and red kale. If all vegan food tasted this good, I’d be vegan. Finally from the Big Bites, I tried the Saffron Butter Glazed Geaux Fish (toasted garlic blackened shrimp, beurre monte blanched heirloom carrots with onion-lemon wilted black kale.) It’s also a great place to go for Happy Hour, with a number of tasty cocktails. 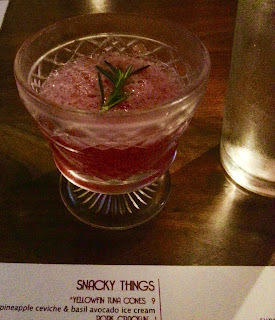 The Georgia O’Keefe II (Cathead honeysuckle vodka, elderflower, hibiscus, citrus and cava) has quite a kick. SoBou, 310 Chartres Street, 504-552-4095, www.sobounola.com. 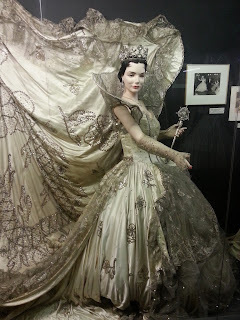 There’s also a Mardi Gras museum on property, open for customer viewing. View costumes, vintage photos and more at the Mardi Gras Museum. Arnaud’s, 813 Bienville Street, 504-523-5433, www.arnauds.com. Dooky Chase’s Restaurant features cajun/creole cuisine and is one of the oldest African American restaurants in the nation, in one of the nation’s oldest African American neighborhoods, Treme. Chef Leah Chase, considered the Queen of Creole Cuisine, has served up classic dishes like red beans and rice, gumbo, fried chicken, serving several presidents, including President Obama. When I visited, back in 2010, there was a portrait of Barack Obama with a huge, satisfied grin. I knew I was in for a treat. I was saddened to hear about the passing of Edgar Lawrence “Dooky” Chase, Jr., husband of Leah Chase and owner of Dooky Chase’s Restaurant, on November 22, 2016. Dooky Chase’s Restaurant, 2301 Orleans Avenue, 504-821-0600, www.dookychaserestaurant.com. 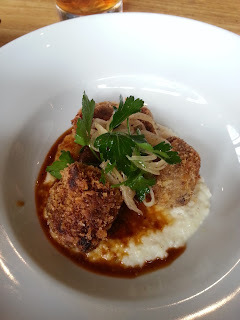 Cochon, located in the Central Business/Warehouse District, is run by chefs Donald Link and Stephen Stryjewski, and is described as pork-centric, Louisiana cuisine and inspired by the Cajan and creole traditions passed down by the grandparents of Chef Link. The restaurant serves locally sourced pork, fresh produce and seafood to create authentic cajan cuisine in a rustic, but cozy interior inside a renovated warehouse. Cochon, 930 Tchoupitoulas Street, 504-588-2133, www.cochonrestaurant.com. 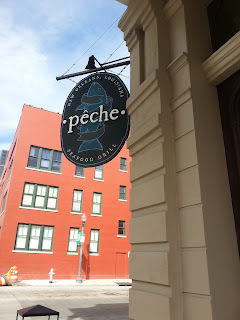 Peche, Chef Link and Stryjewski’s seafood restaurant, is also in the Central Business/Warehouse District. The menu is inspired by South American, Spanish and Gulf Coast cuisines, with fresh, local fish grilled over hardwood coals. 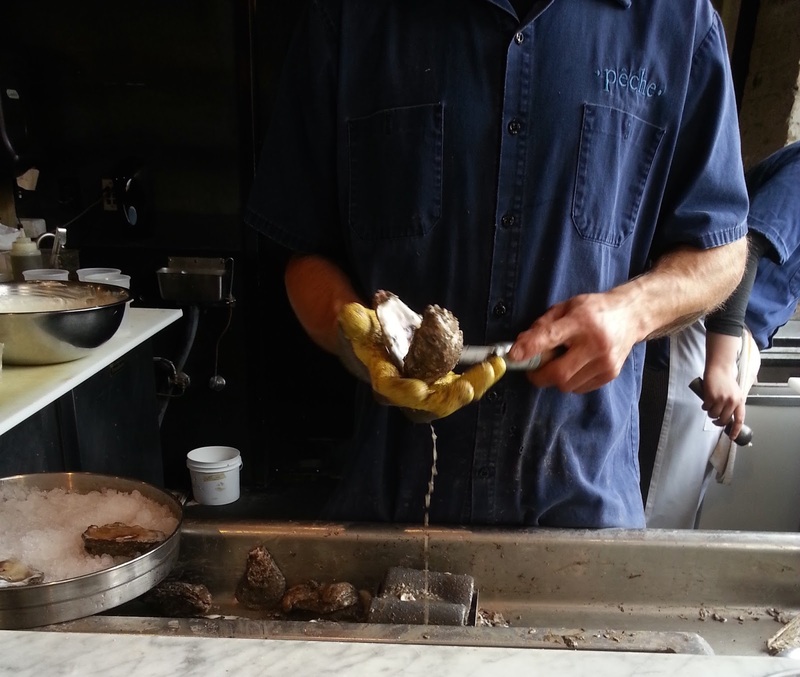 Feast on smothered catfish or the whole grilled fish of the day, as well as fresh oysters at the oyster bar. Let’s say Peche does for fish what Cochon does for pork. A lot. Peche, 800 Magazine Street, 504-522-1744, www.pecherestaurant.com.